March 30, 2017 | 8:45 a.m. The Adams-Friendship School District covers 482 square miles in rural central Wisconsin. The amount of money a school district in Wisconsin receives from the state in a given year depends on a series of funding equations that factor in enrollment, student poverty, local property values, transportation needs and other criteria. The goal of such a formula, in theory, is to help individual districts meet their particular funding needs and even things out between those with wealthier and poorer local property tax bases. Several aspects of the state's funding formula are aimed at supporting rural school districts, including through something called sparsity aid. Wisconsin's state legislature created it in a decade ago (through 2007 Act 20). The concept is to provide more money to small school districts that cover a geographically large but low-population area. Many of the districts receiving sparsity aid are in rural areas where the population is declining and fewer people are having children, and therefore might be losing out on more general funds the state provides districts on a per-pupil basis. With fewer students, it costs a district more per pupil to cover its overhead, from maintaining buildings to paying teachers and staff. These districts also can have higher property values on paper — which means less state aid under the standard formula — but still have high rates of poverty. For its 2017-19 budget request, the Wisconsin Department of Public Instruction proposed — and Gov. Scott Walker adopted in his executive budget — a plan to add a new tier of districts eligible for sparsity aid. In this tier, a district could have between 745 and 1,000 students and qualify for sparsity aid at a rate of $100 per pupil. About 40 school districts would become newly eligible under these rules. Overall, the governor's budget would boost sparsity aid by $20 million, bumping up funding to the existing tier of districts to $400 per pupil. The rationale is to help fill a gap — districts that might have a few more students than the 745 threshold, but still fit the basic description of areas sparsity aid is designed to help. However, as Wisconsin Public Television's Here And Now explored in a March 24, 2017 report, there is yet another funding gap — distinctly rural districts that have more than 1,000 students despite being, in population density terms, quite sparse. Adams-Friendship Area School District will benefit from the state budget proposal, as it includes a general per-student increase for all public schools. However, even with that, district administrator Rick Waski told Here And Now he expects the district to run a $700,000 or $800,000 deficit in its next budget. It won't see any sparsity aid, though, because it has 1,647 total students enrolled in 2016-17, according to data from DPI. The Adams-Friendship district is comparatively vast, covering 482 square miles, yet it has only 3.4 students per square mile — it looks very much like a rural school system that sparsity aid is designed to help. And even though the area has a poverty rate of 14 percent, the state's funding formula penalizes it for high property values, essentially driven up by lakefront properties. The Adams-Friendship Area School District covers 482 square miles in Adams County, located in central Wisconsin. 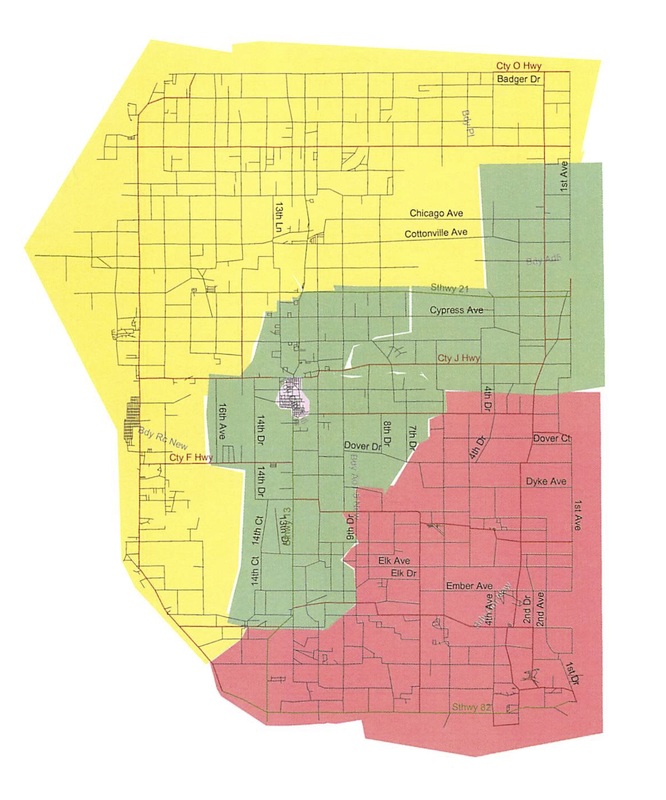 Each shaded area represents a separate elementary school boundary within the district. Waski added that he's still glad other rural school districts will benefit from funding increases, but urges a deeper look at the proposal: "I do think that there needs to be some thought given to how some of the most needy school districts are being completely missed by some of the rules that are associated with the distribution of the money," he said. In a separate interview on Here And Now, Wisconsin Rural Schools Alliance executive director Kim Kaukl said that raising the state's sparsity aid limit to 1,500 would make a huge difference. His organization asked the governor's office to raise it to at least that level. "There are a number of districts that are in the same boat Adams-Friendship is," said Kaukl. Sparsity aid data from DPI shows that 30 school districts in Wisconsin have between 1,000 and 1,500 students and fewer than 10 students per square mile. If some of these districts were split in two or more even smaller segments, then in theory they'd all have a low geographic density of students and qualify for state sparsity aid. Moreover, 16 additional school districts have more than 1,500 students but still have fewer than 10 students per square mile. Overall, if student density were all that mattered in the sparsity formula, some 227 districts would be eligible — more than half the total in the state.